Welcome to Stop 15 of the Consequences Audio Tour! If you’re in a hurry to listen to Chapter 15: BLACKMAIL, hurry over to BOOKWORM BRANDEE RIGHT NOW! Me: Run run to BOOKWORM BRANDEE to find out! Got a few minutes? Then please, let me introduce you to another of the amazing bloggers hosting the Consequences Audio Tour! 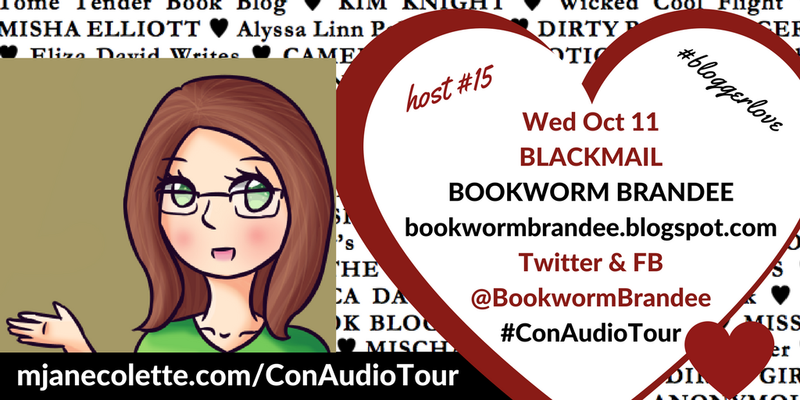 Stop 15 is hosted by the lovely BOOKWORM BRANDEE, an obsessive bookworm, booklover, and all around lovely human. So, I am so thrilled that Bookworm Brandee accepted my invitation to be part of Consequences Audio Tour, and I hope her readers–and you–enjoy the tense “Blackmail” chapter. Thank you, Bookworm Brandee​! Keep on reading, reviewing, and obsessing! And I’m so grateful I stood next to you in that massive never-ending “OMG what are these lines for” line-up! And thank you for getting to know Brandee. Now hop on over to her blog to listen to (and for instructions on how to read) BLACKMAIL!